Would you like to travel together with your family, your partner or a group of friends but still take full advantage of travelling well prepared? Brendafrica also organizes custom sized safaris and of course, children will be well attended to on these safaris. Brendafrica will create and organize a safari that suits all your wishes. The private safari will be, wherever necessary, accompanied by a local guide or by a guide/driver. English guidance is one of the numerous possibilities. Most people love to go camping in the wilderness; however, the private tours provide you with the opportunity to spend your holiday in lodges, bungalows or luxuriously equipped tents with beds. Private safaris can take you to Tanzania, Kenya, Uganda and Zanzibar. Brendafrica gives you ideas for your tailor made safaris, takes care of the hotel reservations, Brendafrica books the safari, Brendafrica arranges transport and guides and Brendafrica gets you the necessary tickets for bus, boat or domestic flights. Brendafrica will meet you, either at the start or at the end of your journey and gives you all the personal service you need. Departure dates custom sized safaris; at any desired time. The costs of a custom sized safari depend on the choices you make. 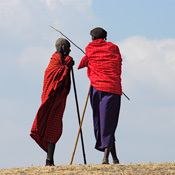 Private Safari of Northern Tanzania, 2 to 4 people: from € 2.085,- p.p. Private Safari of Northern Tanzania, 2 to 4 people in basic hotels and tented lodges: from € 2.245 p.p. Costs of different private safaris will be decided on in consultation.